Background: In medicinal chemistry, thiazoles have gained great importance in antifungal and anticancer drug design and development. Objectives: The aim of this study was to synthesize new quinoline-based thiazolyl hydrazone derivatives and evaluate their anticandidal and anticancer effects. Methods: New thiazolyl hydrazone derivatives were evaluated for their anticandidal effects using disc diffusion method. Ames MPF assay was carried out to determine the genotoxicity of the most effective antifungal derivative. MTT assay was also performed to assess the cytotoxic effects of the compounds on A549 human lung adenocarcinoma, HepG2 human hepatocellular carcinoma, MCF- 7 human breast adenocarcinoma and NIH/3T3 mouse embryonic fibroblast (healthy) cell lines. Results: 4-(4-Fluorophenyl)-2-(2-((quinolin-4-yl)methylene)hydrazinyl)thiazole (4) showed antifungal activity against Candida albicans and Candida krusei in the concentration of 1 mg/mL. In MTT and Ames MPF tests, it was determined that compound 4 did not show cytotoxic and genotoxic effects. MTT assay indicated that 4-(naphthalen-2-yl)-2-(2-((quinolin-4-yl)methylene) hydrazinyl)thiazole (10) showed more selective anticancer activity than cisplatin against A549 and MCF-7 cell lines. 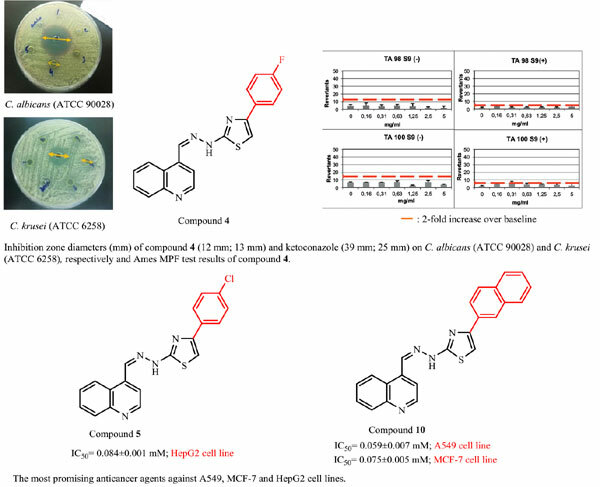 Besides, 4-(4-chlorophenyl)-2-(2-((quinolin-4-yl)methylene)hydrazinyl)thiazole (5) exhibited more selective anticancer activity than cisplatin against HepG2 cell line. Conclusion: Due to their high selectivity index, these compounds are considered as candidate compounds to participate in further research. Keywords: Thiazole, hydrazone, quinoline, anticancer activity, anticandidal activity, genotoxicity. Keywords:Thiazole, hydrazone, quinoline, anticancer activity, anticandidal activity, genotoxicity. Abstract:Background: In medicinal chemistry, thiazoles have gained great importance in antifungal and anticancer drug design and development.